Cambridge calls part 7 a 'gapped text' activity. You get a long text with six paragraphs removed (leaving 6 gaps, hence the name of the task). Your job to is put the paragraphs back into the right place. It's quite hard, and Cambridge make it harder by including an extra paragraph that doesn't fit into any of the spaces. Part 7 is a hard part of the exam that gets easier the more you practice. Read the whole text. Read all the paragraphs. Then pay special attention to the sentences before and after the gap - a lot of the most important information will be there. You don't have to start with the first gap - always start with the one you think is going to be easiest and leave the hardest ones till later. The first answer you choose will be a 1 in 7 chance, but the last one is 1 in 2. But be careful! Sometimes there won't be a clue in the sentence immediately before or after the gap. You really do need to read the whole text to get its meaning - sometimes the 'clue' is the entire paragraph. Detectives use clues to fill in gaps. 'Lord Haversham was killed by a left-handed man at 1:25 in the morning... the only person alone at that time was Charles the butler.' You can develop similar skills by looking for clues in your Cambridge part 7 text. What sort of clues are in a text? In the next section we'll look at those things in more detail. Let's start filling in gaps by looking for clues! Once upon a time there was a boy named Jack. __________________________. Then he died. A - He ate all the chocolate in London. B - Their house was on a hill. Okay so that's pretty easy, right? Jack links to 'he', not 'their'. Also, there's a link between eating all the chocolate in London and then dying, so the story has a logical flow. The documentary featured interviews with many of the top scientists in the field. __________________________. But the story was far from funny, and many viewers wrote to the BBC to complain about its depressing ending. A - It was watched by 8 million people. B - One was Simon Baron-Cohen, brother of the famous comedian. The website was not immediately popular. __________________________. A - However, in 2014 visitor numbers surged and it briefly became the number 1 site in its category. B - In 2014 visitor numbers surged and it briefly became the number 1 site in its category. Which do you think creates a better flow to the story? The sentence before  is 'negative' so I expect a contrast word or phrase to introduce a 'positive' sentence. Thus, A. In the so-called Golden Age of Hollywood, actors and actresses were tied to restrictive contracts that put their interests below the interests of the movie studios. __________________________. A - These days, however, they are free to choose projects that interest them. B - More movies are now made in India than in Los Angeles. Pronouns help us here - 'they' and 'them' in answer A refer to 'actors and actresses'. And we also have help from the time phrase. 'The golden age' is a period of time (if that wasn't clear there's also the past tense 'were tied'), which contrasts (using the contrast phrase 'however') the phrase 'these days'. Sentence B might be true, but is irrelevant to the sentence before the gap. A gap or two might be in speech marks ("") - that makes it pretty easy to find the answer (in my opinion, anyway!). Ask yourself: which of the sentences sounds like it was voiced by a real person? If there is a text written in a neutral register and one of the answers has the pronoun 'I' then that has to go inside the quotation marks. A - He had become a true leader of men. B - I felt like I was on top of the world, like that woman in that movie. There are more tips that I could give you about this section, but the best advice is for you to practice this exercise and learn how the answers are chosen. Don't just do the activity and forget about it - think about why those sentences were taken out. What does Cambridge want to test you on? You and a friend could take a text each, remove some sentences, and test each other. Once you've put the sentences back, you could discuss whether those were the same sentences that Cambridge would remove from the text. Watch as one of our exam experts (me) does a Cambridge Gapped Text activity. Part 8 gives you 4-6 short texts and 10 questions. It's called 'Multiple Matching' because you have to match the ten questions with the short texts. Most students find it easier than the other parts of the reading test and can do it quicker. Start by reading the introduction to the task and the title of the texts. The intro will say something like 'You are going to read an article about the importance of money in sports' and the title might be 'Can You Buy a Gold Medal?' Even if you don't like sport you will have some idea of vocabulary and topics to expect. Next, scan the first text - not too quickly or you'll just have to read it again. Then read question 1 and underline the keywords. Were those keywords (or their synonyms) mentioned in the text? If not, go to question 2. If yes, find the place in the text where it was mentioned and read it more carefully. If it's a match, write A in the first box. Once you've been through the ten questions, you should have between 2 and 4 questions with an A next to them. Now repeat the process with text B. It will be a little quicker this time because instead of going through 10 questions you're only going through 6-8. Repeat with C and D (and E, F, if there are more than 4 texts). This is the most efficient way to do the Multiple Matching exercise - if you have one or two empty spaces at the end, don't panic. You should have time to try to find them. Cambridge don't agree with me about my method. They think it's better to read the questions first, then look for that information in the text. That's why they put the questions before the texts! If you can remember the ten questions when reading through the texts, this method is best. But if you read the questions, then the text, and realise you have forgotten the questions, you've just wasted some precious time! Try both ways and find the method that suits you. Remember that time management is as important as accuracy. Once you've chosen a strategy, keep training using that method. As always, Cambridge give you plenty of opportunity to choose the wrong answer! The most common trap is with exact word matches - if a keyword in the text is the exact same as the word in the question, be careful! It's almost certainly not the answer. Be careful of partial matches. If a question says, 'Which text says that the money spent on sports has always had a political dimension?' then it isn't enough to find a text that mentions politicians, or mentions the current situation. You must find something that matches all the keywords - [money spent on sports] [always] [political]. Finally, a huge problem will be not knowing the meaning of one or more keywords. If you don't understand a certain word in the exam, you won't be alone! (If you understand every word in the Advanced exam maybe you should be studying a Proficiency course!) While preparing for the reading exam, practice the skill of guessing the meanings of unfamiliar words. - Practice guessing the meanings of words. Predict the meaning, based on the context, before you look it up in the dictionary. 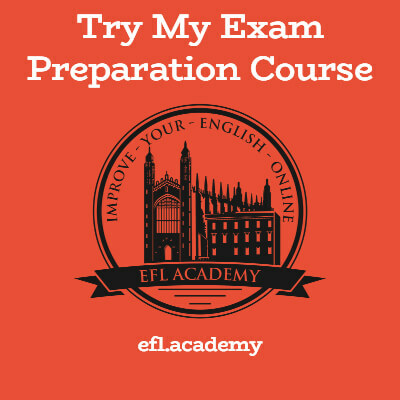 - Take a practice test and photocopy the texts, without looking at the questions. Then take some time to create questions of your own. This will be hard, but when you compare your questions with the ones from Cambridge, you'll learn a lot about how the tests are created. Knowing how Cambridge create the questions will really help you to answer the questions! Try it!